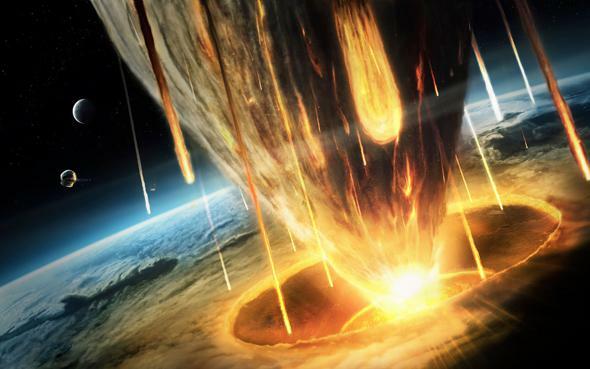 Asteroid 1950 DA: Impact in 2880 very unlikely. What is it about crappy reporting and asteroids? Yeah. The only problem with this: It’s very, very unlikely the asteroid will whack us in 2880, so at best that headline is hugely misleading. And this ain’t “at best.” The real situation will take a moment to explain, but as usual, really cool science is involved. 1950 DA has been in the news lately because a team of scientists examined how rapidly it rotates and found something remarkable: The asteroid spins so quickly that it should fly apart! You might think of asteroids as solid, monolithic chunks of rock, but we know that some are “rubble piles,” collections of smaller rocks held together presumably by their own gravity. They probably started out solid, but repeated collisions over the eons have riddled them with cracks, so they are more like gigantic bags of shattered rock. 1950 DA is one of these rubble piles. It’s also a rapid rotator; one “day” on the asteroid is only about two hours long. It’s about 1.3 kilometers across, which means that if you were standing on its equator, the pull of gravity down, holding you to the surface, would be slightly less than the centrifugal force outward. You’d be launched into space! That would be odd enough on a solid rock, but since 1950 DA isn’t solid, that means it should fly apart. It doesn’t, which means there must be some other force holding it together. The scientists speculate over what that force might be, suggesting the van der Waals force, a complicated effect that can be thought of as an electrostatic charge between molecules (though that’s oversimplifying it). This idea has been around for a few years, but this is the first time it’s been studied in detail specifically for 1950 DA. Learning about asteroids is fascinating and scientifically important, of course, but there are practical considerations as well: If we find an asteroid that might someday hit the Earth, we’ll have to do something to prevent that. One idea is to hit a dangerous asteroid with a space probe with enough force to alter the asteroid’s orbit. The physical characteristics of the rock will be a big factor in that; if it’s metal, rock, or a rubble pile it will react differently to the impact. The more rocks like 1950 DA we study, the better. But of course, this is isn’t where the Telegraph went. As it happens, 1950 DA is what’s called a “near-Earth asteroid,” because its orbit sometimes brings it relatively close to Earth. I’ll note that I mean close on a cosmic scale. Looking over the next few decades, a typical pass is tens of millions of kilometers away, with some as close as 5 million kilometers—which is still more than 10 times farther away than the Moon! Still, that’s in our neighborhood, which is one of the reasons this asteroid is studied so well. It gets close enough that we can get a decent look at it when it passes. The orbit of 1950 DA brings it out past Mars, and a bit closer to the Sun than Earth. Can it impact the Earth? Yes, kind of. Right now, the orbit of the asteroid doesn’t bring it close enough to hit us. But there are forces acting on asteroids over time that subtly change their orbits; one of them is called the YORP effect, a weak force that arises due to the way the asteroid spins and radiates away heat. The infrared photons it emits when it’s warm carry away a teeny tiny bit of momentum, and they act pretty much like an incredibly low-thrust rocket. Over many years, this can change both the rotation of the asteroid as well as the shape of its orbit. Think of it this way. Imagine you’re an outfielder in a baseball game. You see the pitcher throw the ball, and the batter swings. It’s a hit! But one-tenth of a second after the batter makes contact, you close your eyes. Now, based on the fraction of a second you saw the ball move, can you catch it? I would be willing to bet a lot of money you won’t. You weren’t able to watch the ball long enough to get a good fix on its direction, its speed, its position. It could land next to you, or it could fall 40 meters away, or it could be knocked right out of the park. 1950 DA is a bit of an exception, though. We have observations going back many decades (1950 is the year it was discovered), and we also have radar observations of it made in 2001, and those provide very accurate position measurements. This allows the orbit of 1950 DA to be determined farther into the future than most asteroids. Last year, another team of scientists looked into this. They accounted for a lot of small effects on the asteroid, including the YORP thrust, the gravity of the planets, the gravity of other asteroids, and so on. They found that the probability of an impact in 2880 is about 2.48 x 10-4, which is about 1 in 4,000. That’s really small. That’s one reason the Telegraph headline is so awful (note: They also use an old probability of 1 in 300 for an impact, too). The other is simply due to its hyperventilating fear-mongering, something I find very distasteful. To say the least. I’m no fan of the Telegraph; their predilection for printing global warming denial is loathsome, and they dip their toe into other forms of pseudoscience as well. I’ll note this story was picked up uncritically by other venues like MSN UK (which added its own errors; saying the asteroid was discovered by the team of scientists I write about above) and the Daily News, too. Tip o’ the Whipple Shield to Christine Pulliam and David Bustard for pointing these articles out to me.